None reported yet. Please press the '+' button above to add one. Right panel: Expression and localization of PfMRP within asexual stages of the W2 parasite. 1 (green, anti-PfMRP; 2 (red), anti-PfMSP-1 (PFI1475w); 3 (blue), DAPI dye; 4, merged 1-3; 5, merged 1-4 and diffrential interference contrast (DIC). A, free merozoites; B, a trophozoite; C, a schizont. 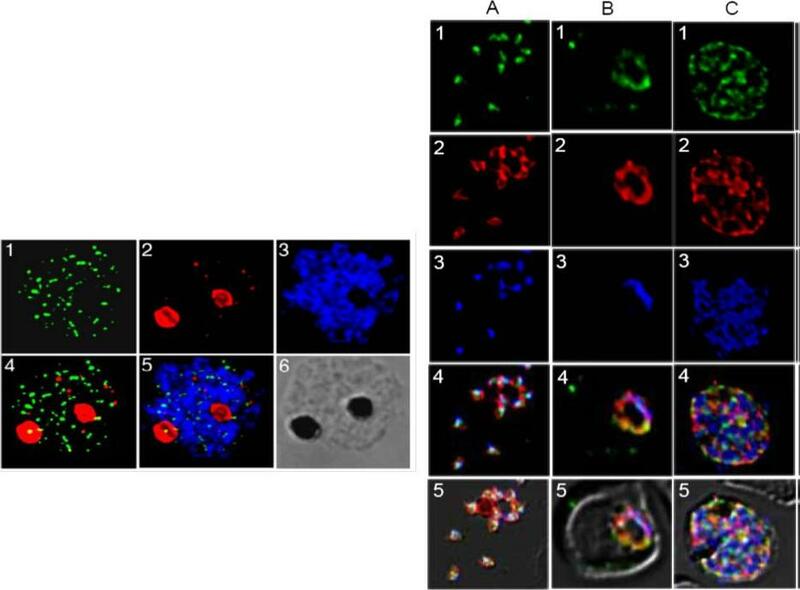 In merozoites, PfMRP was expressed in membrane-bound vesicles located inside the parasite plasma membrane and did not co-localize with PfMSP-1 on plasma membrane. In trophozoite and schizont stages, PfMRP expression increased with parasite growth, located on an extensive network of membrane structures including plasma membrane although it appeared to be present in ‘patches’. Left panel: Immunofluorescent assay (IFA) localization of PfMRP and PfCRT in mature schizonts and merozoites. 1, anti-PfMRP; 2, anti-PfCRT, staining food vacuoles; 3, DAPI; 4, merged images of 1 and 2; 5, merged image of 1-3; and 6, differential interference contrast (DIC).Raj DK, Mu J, Jiang H, Kabat J, Singh S, Sullivan M, Fay MP, McCutchan TF, Su XZ. 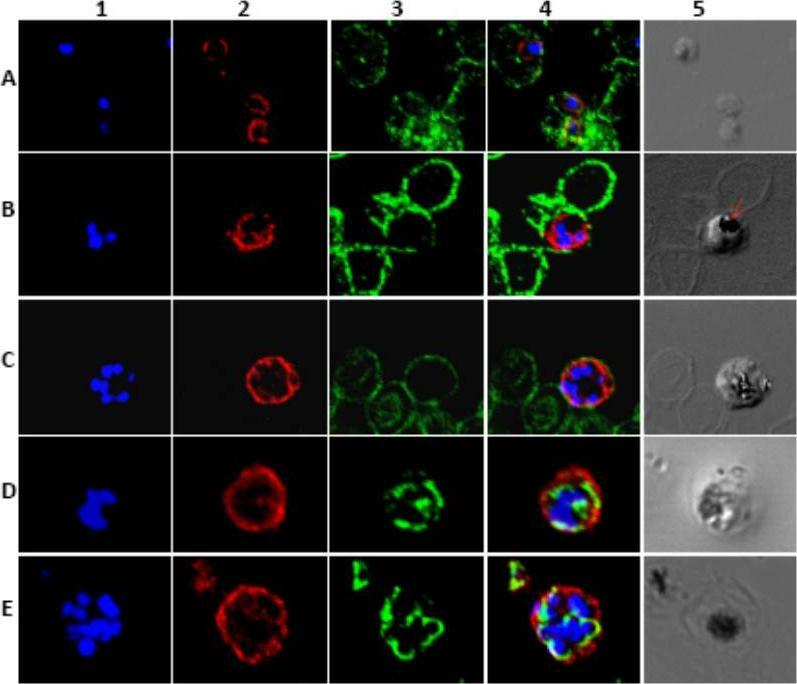 Disruption of a Plasmodium falciparum multidrug resistance-associated protein (PFMRP) alters its fitness and transport of antimalarial drugs and glutathione. J Biol Chem. 2008 284(12):7687-96. Localization of PfMRP1 within the asexual stages of P. falciparum. In column 1 blue (DAPI) shows the nuclear staining. In column 2 red shows PfMRP1 staining. In column 3 green shows glycophorin A (A, B, and C) or PfERC (D and E) staining. Column 4 shows the merge of column 1–3. Finally, column 5 shows the differential interference contrast image. Represented in rows: A, rings; B, early schizont; C, schizont; D, trophozoite; E, schizont and ring. The arrow indicates the food vacuole. The protein is localized to the plasma membrane in all asexual stages of the parasite.Kavishe RA, van den Heuvel JJ, van de Vegte-Bolmer M, Luty AJ, Russel FG, Koenderink JB. Localization of the ATP-binding cassette (ABC) transport proteins PfMRP1, PfMRP2, and PfMDR5 at the Plasmodium falciparum plasma membrane. Malar J. 2009 8:205.